This favorite resource for therapists, educators, parents and kids, makes teaching and incorporating mindfulness into your home, classroom and therapy session super easy and fun. 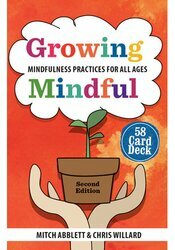 Now in its 2nd Edition-the updated Growing Mindful card deck features 56 unique mindfulness activities to teach awareness, how to be present in the moment, and cultivate kindness and curiosity. Perfect for all ages!